On Sept. 27-29, 2016, The Contact Center Association of the Philippines (CCAP) will host the 11th International Contact Center Conference and Expo (ICCCE) at the grand ballroom of the Marriott Hotel, Resorts Drive in Pasay City, Metro Manila, Philippines. “The Philippines continues to be the most preferred offshore destination worldwide. Despite the challenges, the preference is still the Philippines for voice, as a compelling value proposition differentiated from any other market out there,” says Benedict Hernandez, president of CCAP. Undeniably, the ICCCE is the largest contact center industry event by size and scope anywhere. It is the leading learning and networking event of the Philippine center industry. With the theme “Contact Islands: Opportunities in the Ultimate Customer Experience Paradise,” the ICCCE is ready to focus and demonstrate the industry milestones and show that it is way ahead of the challenges ahead. 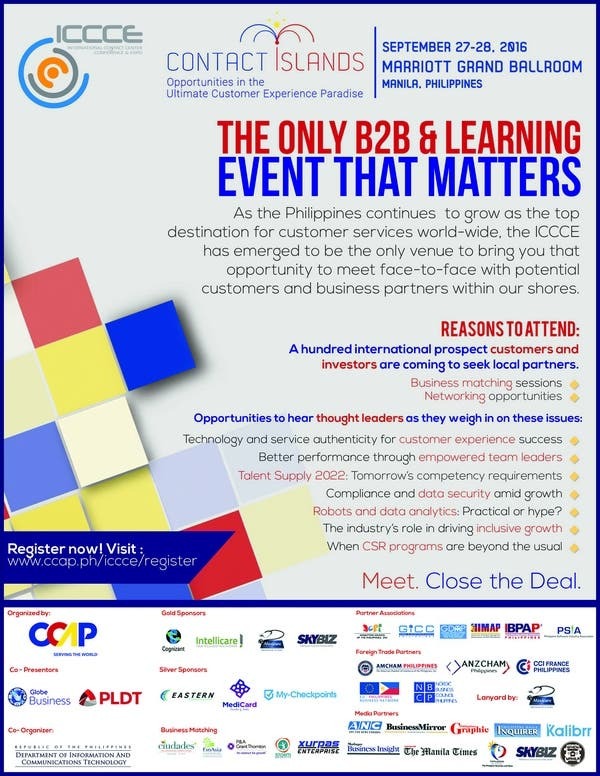 The 11th ICCCE undertook the ‘first-of-its-kind’ mission of reaching out to investors and clients from North America, Europe, Australian-New Zealand, and Asia and bring them to an immersive experience of the Filipino’s incredible service culture, the industry’s client-centricity and innovation capability. They will also have the chance to interact with world class business partners and enablers, connect with the country’s business-supportive government agencies and explore investment opportunities during the business matching meetings. For the first time, delegates from different parts of the world will meet each other and see for themselves how innovation and excellence come together with our warm and genuine service. “We are incredibly excited with the commitments we have seen across geographies to join us in this year’s ICCCE. This is the first time ever in our industry that we are able to gather over 100 international investors and clients to learn and explore business opportunities in the Philippines,” said Benedict Hernandez, President of CCAP. Various relevant and important topics will be discussed with emphasize on the “Digital Phenomenon” and how the industry uses it to its advantage. There will be discussions that will cover location strategies, operations, human resources, and technology, among others. The ICCCE has indeed found a winning formula: bringing in industry experts to discuss the most important topics thereby giving the best possible insights of the utmost relevance to the industry. On its eleventh year of success, speakers from Fortune 500 companies and world-famous companies such as Accenture, EGS, Frost & Sullivan, among others, are certainly something to look forward to. CCAP President Benedict Hernandez will be there to present his industry report which will highlight all the pertinent achievements and the specific challenges in the contact center industry field. Secretary Rodolfo Salalima of the Department of Information and Communications Technology is invited to give his keynote message to the three-day conference. The Philippine IT-BPM industry has grown significantly in the last five years, not just in terms of employees, but also in revenue. The Central Bank predicts that by 2017, the IT-BPM (Information Technology and Business Process Management will be the Philippine’s largest source of income. From 525,000 employees in 2010 and $8.9 billion in revenue to an expected 1.3 million jobs and over $25 billion in revenue for 2016, it is to date, the most lucrative and fastest growing industry in the Philippines. One of the primary goals of the ICCCE is to equip contact center professionals with the proper knowledge and skill set of the ever-moving trends in the industry as well as innovations and new technologies that they can apply to the workplace. It is also a venue for non-contact center representatives such as suppliers, real estate professionals, retailers, financial institutions etc. to understand how they can be part and take advantage of being in this ever growing industry as clients or service providers. ICCCE’s two-day conference will give the prospect clients and investors a chance to get firsthand learning experience from industry experts and leaders on how do business in the country, meet with prospect business partners and enablers, connect with industry peers, and see live operations with our business tours. The pre-conference activity on September 27 will feature a business briefing for these international delegates on how to do business in the Philippines. Experts from the Department of Trade and Industry (DTI) and the Philippine Economic Zone Authority (PEZA) will give a rundown on prevailing business policies and incentives. “Of course, ICCCE will not be complete with its much anticipated learning dialogues with leading thinkers and disruptors of our industry,” said Jojo Uligan, CCAP Board Trustee. “We have an unbelievable line up of thought leaders who will discuss their views on current issues like: innovations in customer experience, disruptive technologies, data analytics, robotics and artificial intelligence, cyber security, the workforce of the future, the industry’s role in inclusive growth, among others,” Uligan added. Discussing these relevant market trends in the dynamic landscape of the IT-BPM industry include experts from: Facebook, Frost and Sullivan, National Data Privacy Commission, Deloitte, Accenture, Telstra, Baker & McKenzie, RIS Philippines, BagoSphere and other top notched thought leaders. An optional visit of the different contact centers and leisure tours also await international delegates. 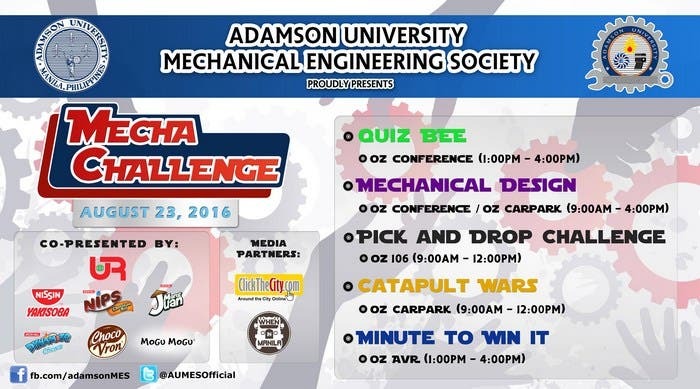 To find out more about how to be part of this this unique event, please visit www.ccap.ph/iccce or contact the the CCAP Secretariat at +63 (02) 843-0603 or via e-mail at events@­ccap.ph.